This article is about the 1848 insurrection. For the film about it, see Five Days of Milan (film). In 1848, the Milanese launched an anti-Austrian campaign as early as 1 January. On New Years Day the Milanese started to boycott gambling and tobacco products, which were government monopolies that brought in over 5 million lire a year. The boycott culminated in a bloody street battle on 3 January, when Austrian soldiers, in batches of three, were being insulted and pelted with stones by an angry crowd. The soldiers then gathered together in groups of a dozen and charged the crowd with swords and bayonets, killing five and wounding another 59. Radetzky confined his troops to barracks for five days. The protests were over, but two months later, when news reached Milan of the uprising in Vienna and the fall of Metternich, the Milanese took to the streets again, on 18 March. 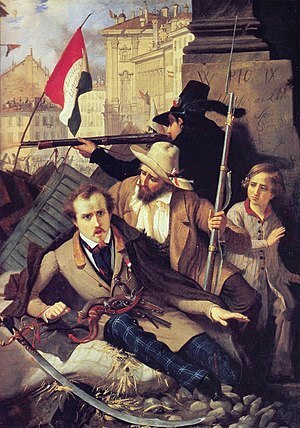 Almost simultaneous with the popular uprisings of 1848 in the Kingdom of Lombardy–Venetia, on 18 March of that year, the city of Milan also rose. This was the first evidence of how effective popular initiative, guided by those in the Risorgimento, was able to influence Charles Albert of Sardinia. The Austrian garrison at Milan was well equipped and commanded by an experienced general, Joseph Radetzky von Radetz, who despite being over 80 years old, was energetic and rigid. Radetzky had no intention of yielding to the uprising. However, the whole city fought throughout the streets, raising barricades, firing from windows and roofs, and urging the rural population to join them. The populace was backed by the archbishop and at least 100 priests joined in the fighting against the Austrians. A bust of Pope Pius IX was even hoisted onto the barricades. A provisional government of Milan was formed and presided over by the podestà, Gabrio Casati and a council of war under Carlo Cattaneo. The Martinitt (orphanage children) worked as message runners to all parts of the town. Radetzky saw the difficulty of resisting under siege in the city centre, but while afraid of being attacked by the Piedmontese army and peasants from the countryside, he preferred to withdraw after losing control of the Porta Tosa (now Porta Vittoria) to the rebels. On the evening of 22 March, the Austrians withdrew towards the "Quadrilatero" (the fortified zone made up of the four cities of Verona, Legnago, Mantua and Peschiera del Garda), taking with them several hostages arrested at the start of the uprising. Meanwhile, the rest of Lombard and Venetic territory was free. In memory of these days, the official newspaper of the temporary government was called simply Il 22 marzo (22 March), which began publication on 26 March at the Palazzo Marino under the direction of Carlo Tenca. A monument to the uprising by the sculptor Giuseppe Grandi was built at what is now Porta Vittoria. ^ a b Grenville, John Ashley Soames (2000). Europe reshaped, 1848–1878. Oxford. ^ a b c Berkeley, George F.-H. (1940). Italy in the Making January 1st 1848 to November 16th 1848. Cambridge. ^ a b Stillman, William James (1898). The union of Italy, 1815–1895. Cambridge. ^ a b c Ginsborg, Paul (1979). Daniele Manin and the Venetian revolution of 1848–49. Bristol. ^ Maurice, Charles Edmund (1887). The revolutionary movement of 1848–9 in Italy, Austria Hungary, and Germany. New York. ^ American Bibliographical Center (1991). Historical abstracts: Volume 42, Issues 3–4. Santa Barbara. ^ a b c d Rüstow, Wilhelm (1862). Der italienische Krieg von 1848 und 1849. Zürich. ^ a b Whyte, Arthur James Beresford (1975). The political life and letters of Cavour, 1848–1861. Santa Barbara. ^ Svoboda, Johann (1870). Die Zöglinge der Wiener-Neustädter Militär-Akademie. Wien. ^ de Marguerittes, Julie (1859). Italy and the War of 1859. Philadelphia. ^ a b c d Chapman, Tim (2008). The risorgimento: Italy 1815–71. Penrith. ^ a b Stearns, Peter N. (1974). 1848: the revolutionary tide in Europe. New York. ^ Whittam, John (1977). Politics of the Italian Army, 1861–1918. London. ^ a b Wilhelm Meyer-Ott, Wilhelm Rüstow (1850). Die Kriegerischen Ereignisse in Italien in den Jahren 1848 und 1849. Zürich. ^ Gooch, John (1986). The unification of Italy. London. ^ Giovanni Luseroni (2016). Giuseppe Mazzini e i Democratici nel Quarantotto Lombardo. Gangemi Editore spa. p. 130. Olivari, Stefano and Giulia Brasca (2015). Milan 360°: A metropolis to discover, among art, culture, technology and fashion. OlliService Multimedia. pp. 9–11. (in Italian) Elena Fontanella, a cura di, Giovani ribelli del '48. Memorie del Risorgimento lombardo , Firenze, Fratelli Alinari, 2011. ISBN 978-88-95849-14-0. Testi di Aldo A. Mola, Giancarlo Lacchin, Roberto Lauro, Maurizio Griffo, Agostino Giovagnoli, Cecilia Dau Novelli, Romano Bracalini, Carlo Cattaneo, Gianni Oliva, Emanuele Bettini, Matteo Sanfilippo, Giuseppe Poletta, Franco Della Peruta, Fulvio Peirone, Gabriella Bonacchi, Anna Maria Isastia, Elena Fontanella, Andrea Vento, Vittorio Nichilo, Giorgio Cosmacini, Roberto Guerri, Lucia Romaniello, Giuseppe Garibaldi, Gian Paolo Caprettini, Gian Mario Benzing, Roberto Cassanelli. Wikimedia Commons has media related to Five Days of Milan. (in Italian) Monument to the "Cinque Giornate di Milano"
This page was last edited on 8 February 2019, at 12:31 (UTC).